It was a perfect day today to sketch outside. On my way home I stopped in Fairhaven, Massachusetts and did a quick sketch of Fort Phoenix. 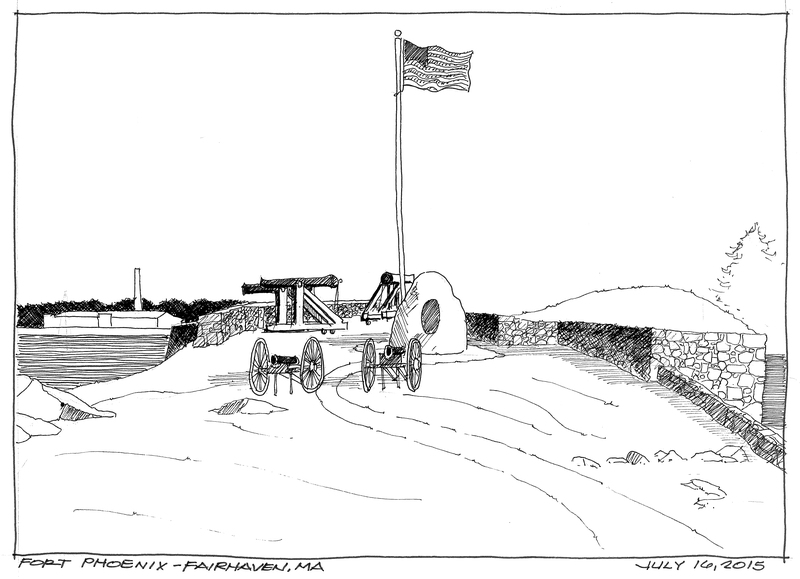 Fort Phoenix is an American Revolutionary War-era fort located at the entrance to the Fairhaven-New Bedford harbor in Fairhaven. Massachusetts. In 1775, only 25 days after the battle of Lexington-Concord, the fort was the site of the first naval battle of the revolutionary war when the Americans captured 2 British sloops. On September 5–6, 1778, Fort Phoenix was destroyed by the British when they were raiding the harbor. When it was rebuilt, it was given the name “Fort Phoenix” after the mythical bird that rose from its own ashes. Not a great subject or interesting sketch, but it was beautiful to sit by the sea and sketch. Pilot Namiki Falcon fountain pen with Noodler’s ink in a Stillman and Birn Sketchbook.